Greek historian Herodotus has had an enduring reputation for indulging in well, let’s just call them embellishments, ever since he wrote The Histories in the 5th century B.C. I fondly recall my 7th grade Social Studies teacher calling him Herodotus the Liar, and scholars have alternately referred to him as the Father of History and the Father of Lies. So even descriptions of things he claimed to have witnessed personally are taken with a grain of salt. His voyage to Egypt, for example, documented in Book II (Euterpe) of The Histories, has been subject of vigorous debate among historians. A number of them have questioned whether he ever stepped foot in the country given how many dubious statements are in his account. “baris” (for so they call this sort of boat) after it; while the stone, which is pulled along in the wake of the vessel, and lies deep in the water, keeps the boat straight. There are a vast number of these vessels in Egypt, and some of them are of many thousand talents’ burthen. 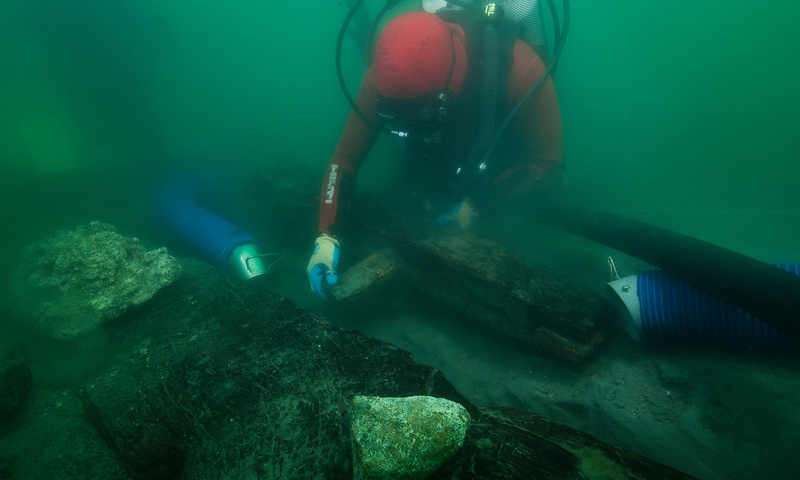 The wreck, number 17 of more than 70 vessels that have been discovered at the Thonis-Heracleion site, is larger than the one described by Herodotus. 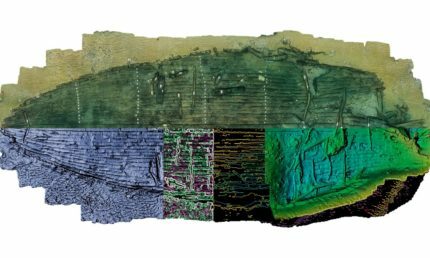 It was an estimated 28 meters (92 feet) long when intact, one of the largest ancient Egyptian trading vessels ever found. 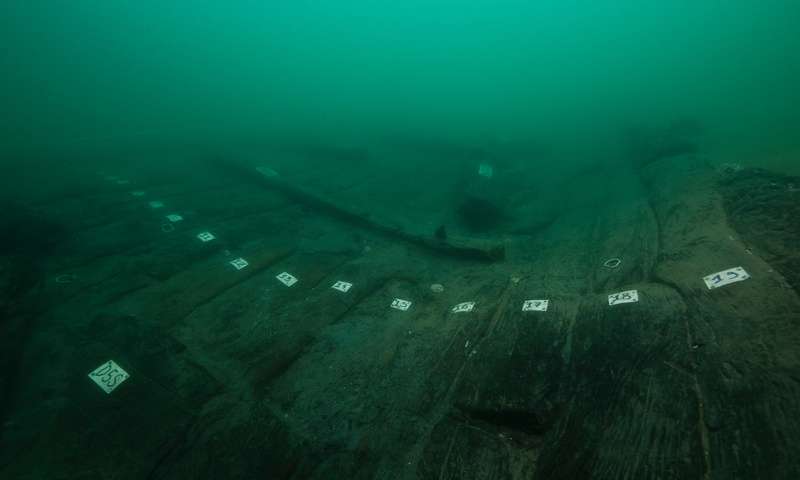 Its crescent-shaped hull made of thick planks joined with tenons matches Herodotus’ description very well. This entry was posted on Thursday, March 21st, 2019 at 11:41 PM	and is filed under Ancient. You can follow any responses to this entry through the RSS 2.0 feed. You can skip to the end and leave a response. Pinging is currently not allowed. I find it amazing when a written account and the subject of that account, lost for thousands of years, can be re-united. I wonder what they used the boat for, specifically? What is Greek for “I told you so!”? Calling Herodotus are lier seems a bit disingenuous, in light of the honesty we find in today’s mainstream media… And he has the burden of innumerable re-writings over thousands of years to contend with. εὕρηκας … Accidentally I do own a 640 pages edition of the ‘Histories’, and the referenced text is BkII.96. According to the annotations, the ἀκάνθος referenced is a type of acacia, my guess either ‘Acanthus arboreus’ (no idea what it looks like, but ‘arboreus’ sounds like a tree to me, and it is found in Egypt), or, ‘Vachellia nilotica’ (a.k.a. gum arabic tree, babul, thorn mimosa, Egyptian acacia or thorny acacia, …the tree’s wood is “very durable if water-seasoned” and its uses include tool handles and lumber for boats. The wood has a density of about 1170 kg/m3). Moreover, “texts from the 18th Dynasty” (1550 BC–1292 BC) already seem to refer to ‘Bari’ as boats used for transports down the Nile. The stone dragging after it behind sunk deep in the water keeps its course straight. To call the author a “liar”, I’d say, would be misleading. May I ask: What is ‘Social Studies’ all about [I do ask here as a non native speaker], and why are ‘Social Studies’ dealing with Herodotus in the first place? or in other words: What would be so ‘social’ about him? Is 7th grade the right time for this particular matter? Egypt and the Greek colonies in the Black Sea, he actually seems to have visited himself. What he did not witness, he was obviously been told by the locals (with some interpretation), or he simply had read it elsewhere (like I did myself). How come, for example, that folks like Claudius Ptolemy (not to be confused with the Egyptian ‘Ptolemy’) in his Γεωγραφικὴ Ὑφήγησις were around 150 AD so well informed about so many places in Northern Europe or in Asia that even I highly doubt that he had ever seen any of them? Cf. Σετουάκωτον at 34° 00′ long. (ptolem. ), 48° 20′ or Βέργιον at 33°00′ long. (ptolem), 49°30′. Book 7 of Ptolemy’s work, covering the Indian subcontinent and adjacent parts of Southeast Asia. (Stückelberger and Grasshoff list 12,883 unique records in their places table. Of those, 1,217 records pertain to Book 7. Within that set, 640 records actually have a Ptolemy latitude and longitude associated with them). Social Studies is generally used inter-changeably with History in the USA school systems. I agree the title is vague and is not aways accurate. In common usage from the 1960’s through current usage. I prefer “history” with a time modifier.